So later than we should of, we set off up the path from Glen Brittle campsite, our enthusiasm making light work of the lengthy path. A few showers were giving us nice rainbows, and every time I looked at my watch, I was surprised at how much time had passed. There was an unexpected fork in the path, and we headed up left, skirting below the cliffs of Sron na Ciche, the path getting steeper and rockier. 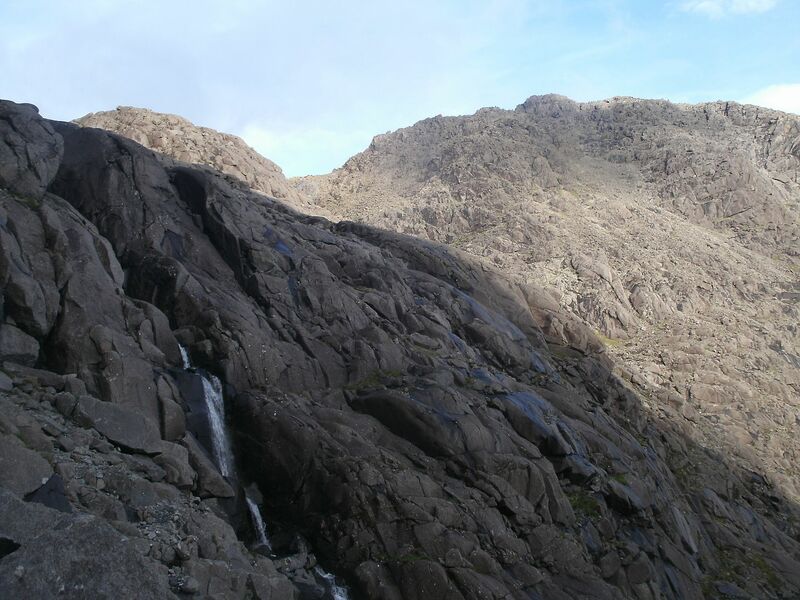 The mouth of the corrie was in sight, and cripes it looked slabby! The path seemed to skirt above a huge boulderfield to get back down to the bottom of a gully that went upward. We cut the corner and went straight accross. This was really cool, with huge boulders creating an assault course that had us laughing and having a good time. We reached the bottom of the gully, and headed up, it not being nearly as steep or tough as it looked. Half way up, a mega-shower came over, so we descended a little to get under a flake of rock that had come to leave a dry crevice underneath. 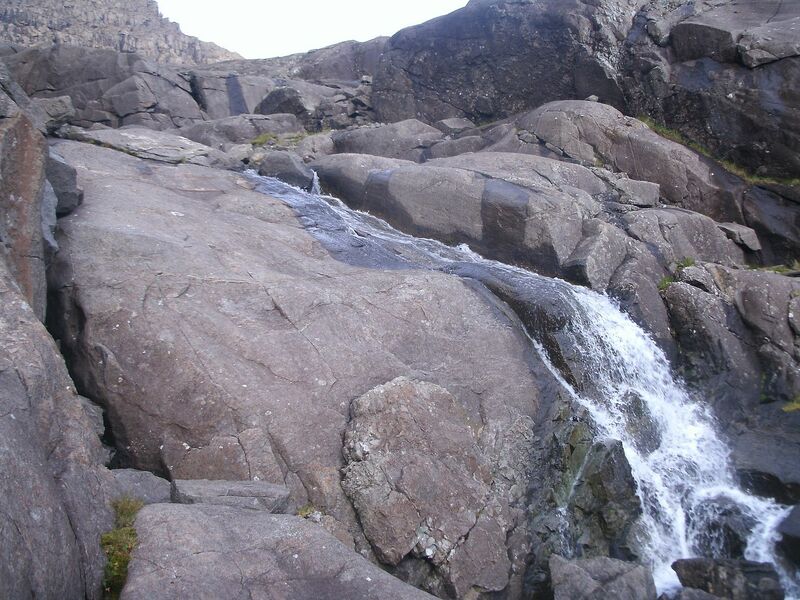 The wool underneath the boulder, indicatind that we werent the first creatures to shelter there The shower went on a bit, and it was a shelter for one rather than two But it eased eventually, and we made it up to the waterfall beyond. 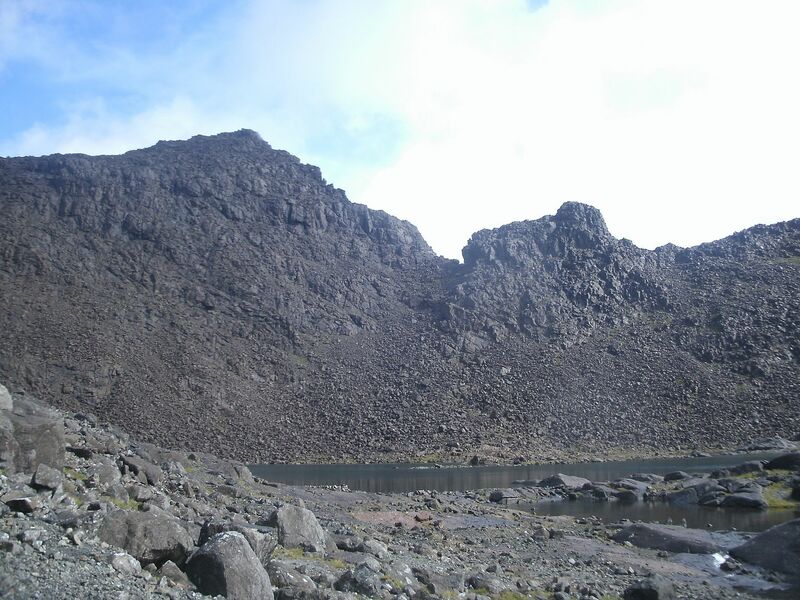 I had only ever seen it from above, and it looked a lot different than I remembered... We went round the lochan leftward, blazing sunshine at that point made us want to have a seat and some scraw. 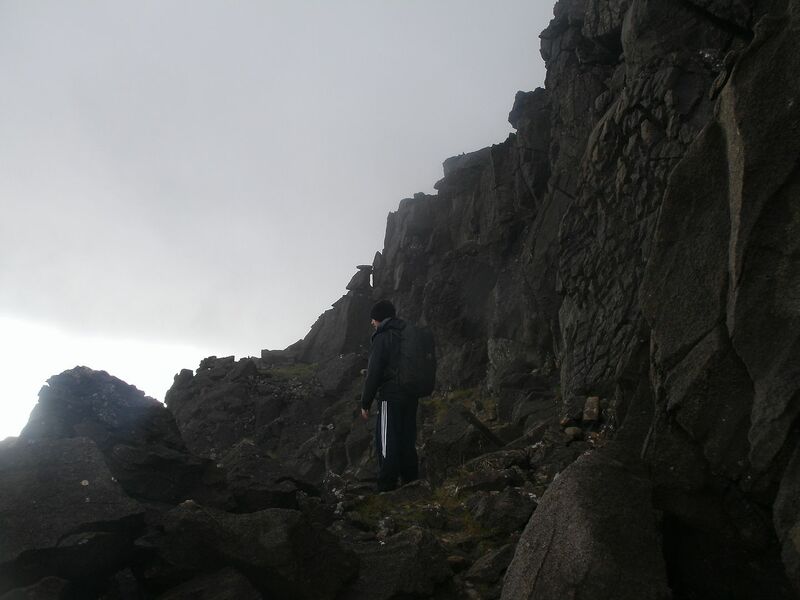 We eventually got up the motivation to get going again, and headed up one of the many faint scree paths up the corrie, aiming for the right of Thearlaich Dubh Gap. 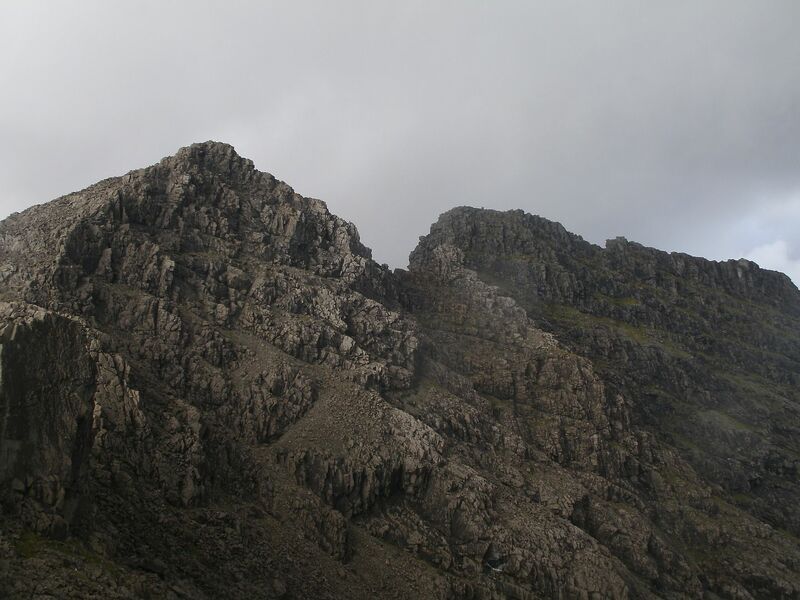 As we got up a bit, the screes gave way to massive boulders that were a joy to clamber over Then we reached the main ridge, always an amazing moment the first glimpse of the other side. 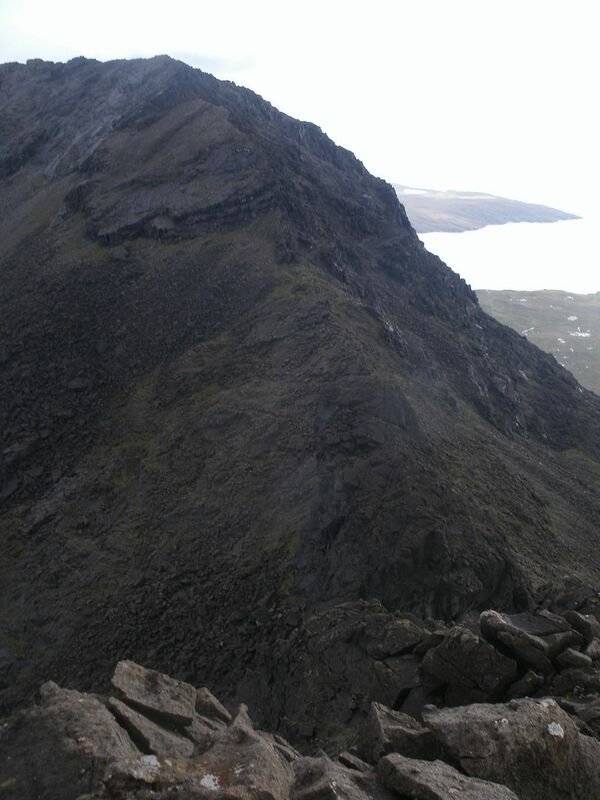 The way ahead looked fun and did not disappoint, Da Bheinn was a joy. The descent was a lot less tricky than I expected too, even though the clag rolled in for a bit. 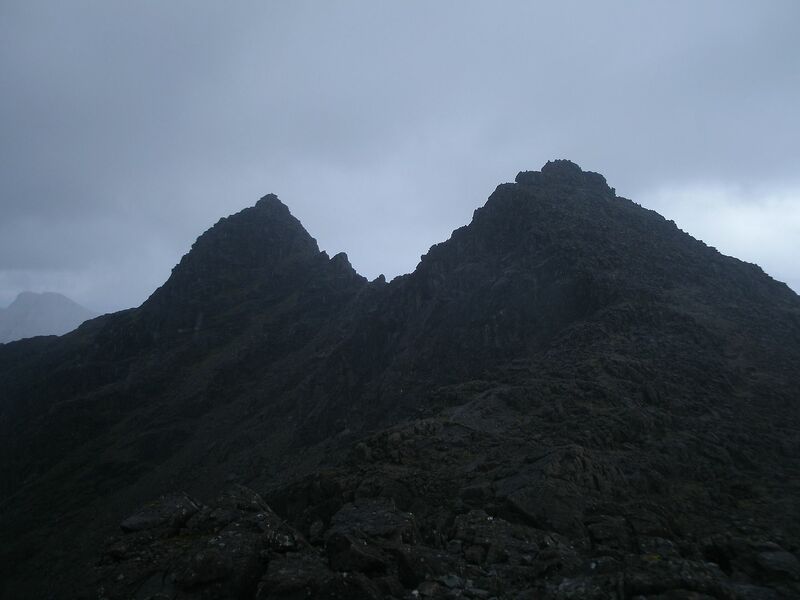 Bealach looked a bit scary with huge blocks dividing the ridge. it was all basalty round there and it wasnt dry, so there were a few precarious slips, bruised shins and much adrenalin pumped. 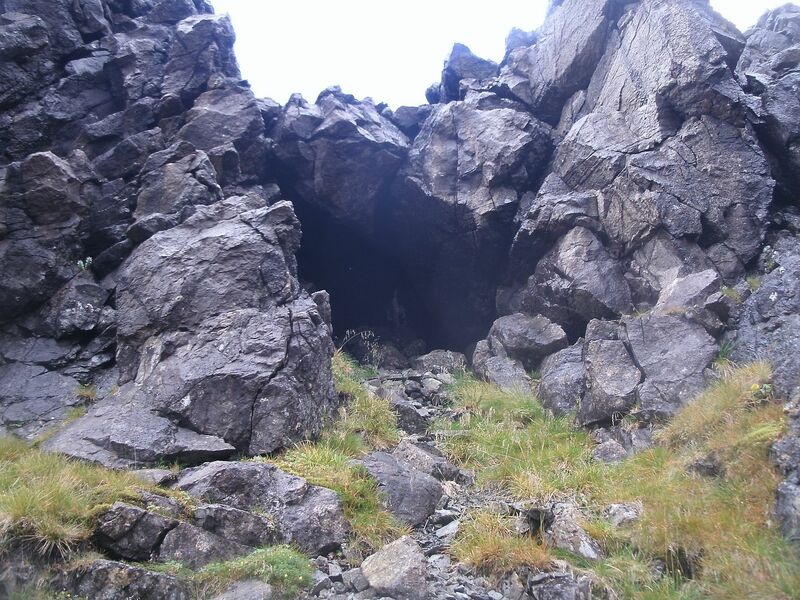 We were only on the path a few yards when I spotted a cave to the left (well not a proper cave, just some fallen boulders with space underneath) which I couldn't resist. 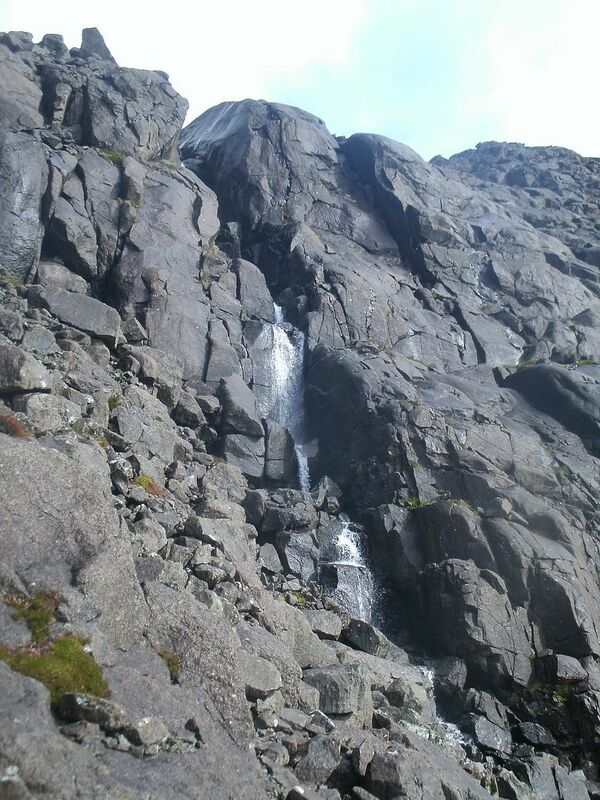 I went to explore..
We made it up another pitch, and found we were just a few yards from the top - yaay! 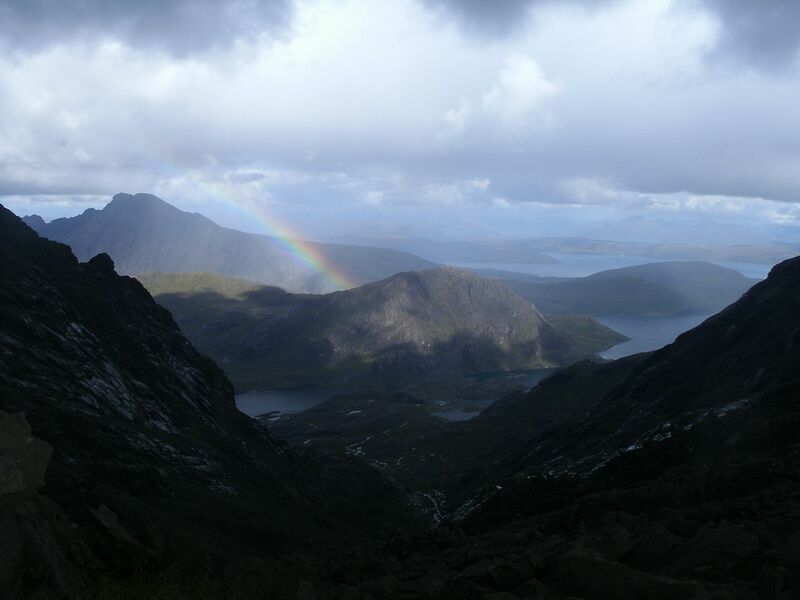 We reascended half of Da Bheinn, before picking up a traversing path to take us toward the castle. The first path we chose, was a dead end, so there was a bit of retracing of steps, and slogging up a bit of difficult ground. 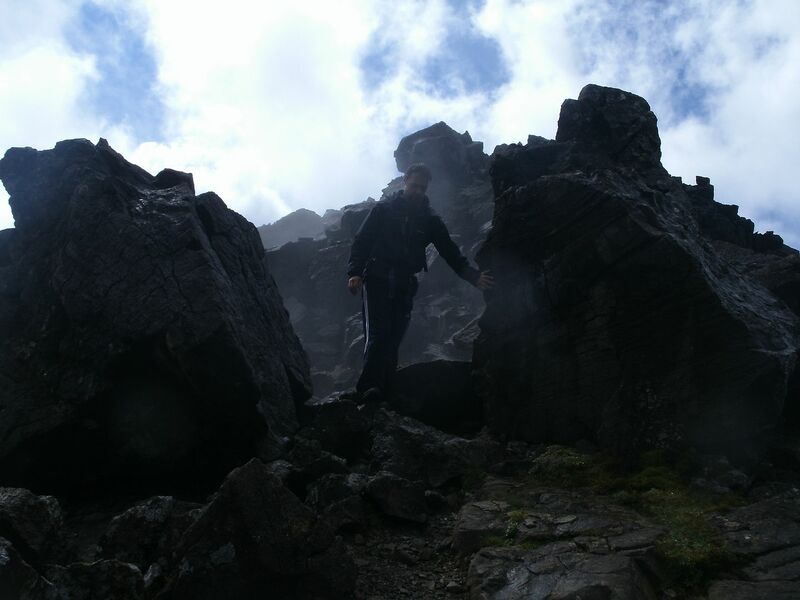 We found our way though, and made our way carefully down, pointing out geological features in the rock to one another. 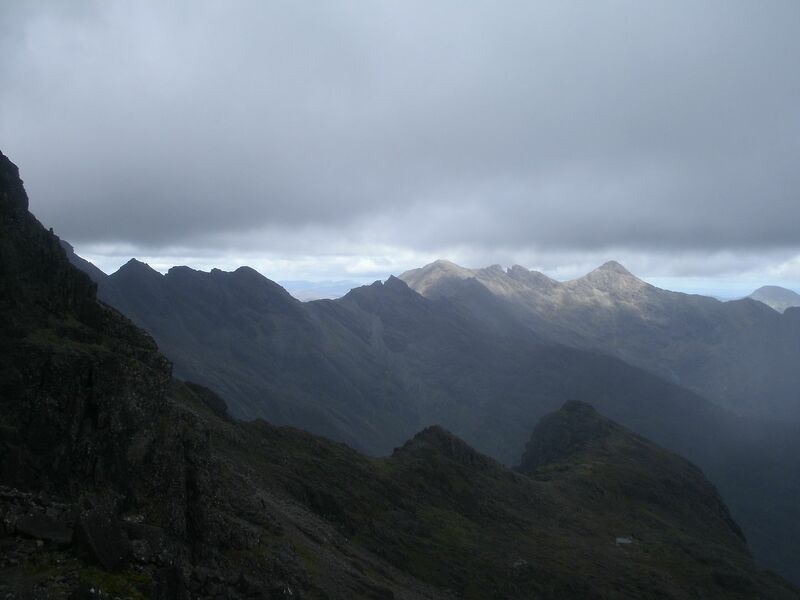 We stuck to the crest as much as possible for the ascent of Sgurr nan Eag, impossible at one point, but generally really good fun. My hands had started to burn from the sandpaper effect of the gabbro, but I was having too much fun to care. it was brilliant! Even Dougie said it was far better than he remembered. The ridge got flatter, and the going easier, until we finally got to the summit in beautiful conditions. We could see way into the mainland, and out to the outer Hebredes, so we spent a long time hill spotting and generally enjoying our situation. The sun had an evening feel to it already though, and we eventually headed off to find our way back to the corrie. We traversed left again, then found a wee rake down, and repeated this theme for a good while, crossing boulderfields down near the bottom of the corrie. I was very glad to be down, as there had been a couple of moments where the way was not obvious at all. We were tiring now..
We made it back to the path, and followed it more closely to the burn until the top of the waterfall where we were forced right to get down easily. Dougie found a fallen walker here last time, so we perhaps a little paranoid about the dangers there.. The scramble down was a little hairy, and it was a good feeling to get back to the decent path for the weary stomp back to the car. Last edited by basscadet on Mon Sep 01, 2014 9:12 am, edited 1 time in total. That was almost as exciting to read as to walk You are so brave - I wish I had half your courage! I don't think I'll be rushing to do these any time soon. Do you just make your own routes up or do you follow the established paths? 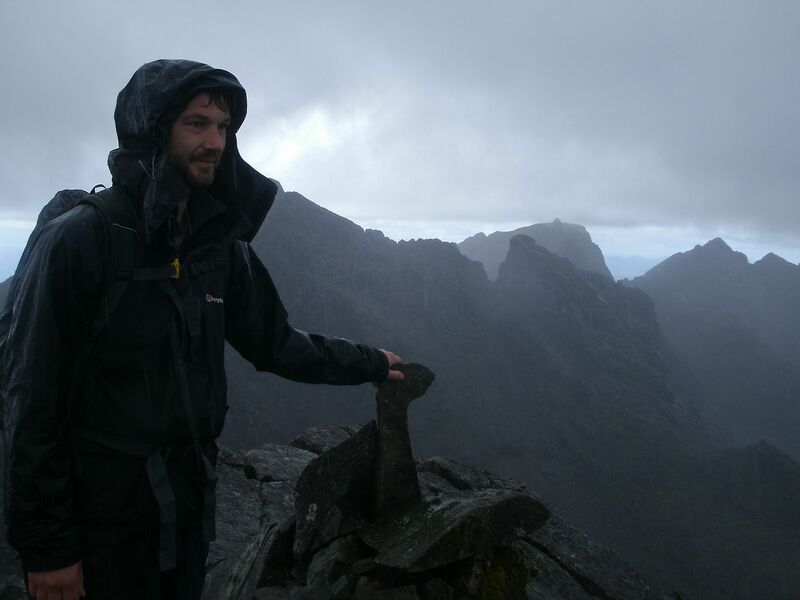 What fantastic views you got, though, and all weathers in just a few hours. AnnieMacD wrote: That was almost as exciting to read as to walk You are so brave - I wish I had half your courage! I don't think I'll be rushing to do these any time soon. Do you just make your own routes up or do you follow the established paths? 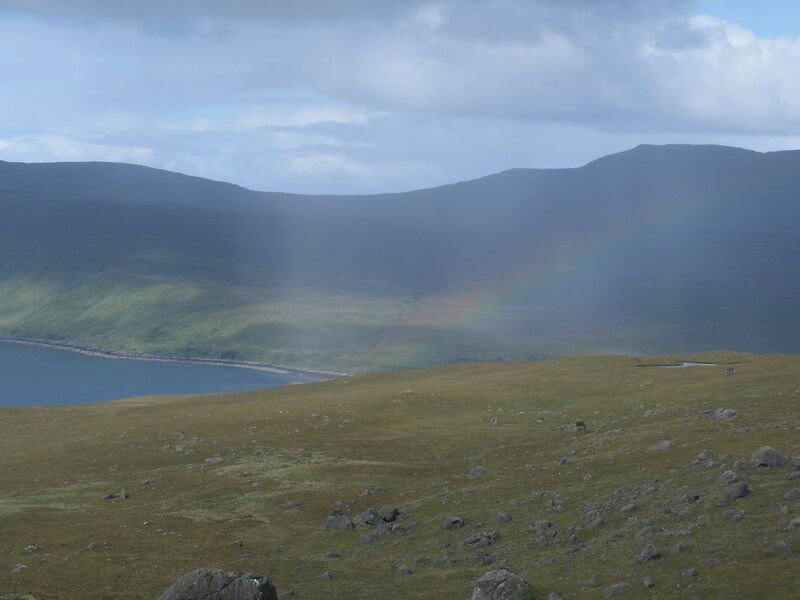 What fantastic views you got, though, and all weathers in just a few hours. Oh its a shame. 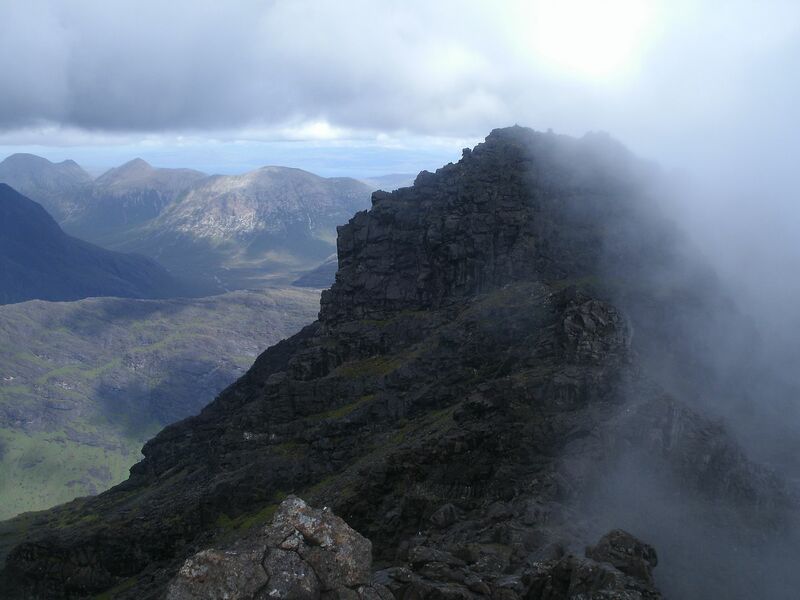 The Cuillin is rugged and rocky, but its not a completely inhospitable place. There are paths everywhere, so easy to find easy routes. 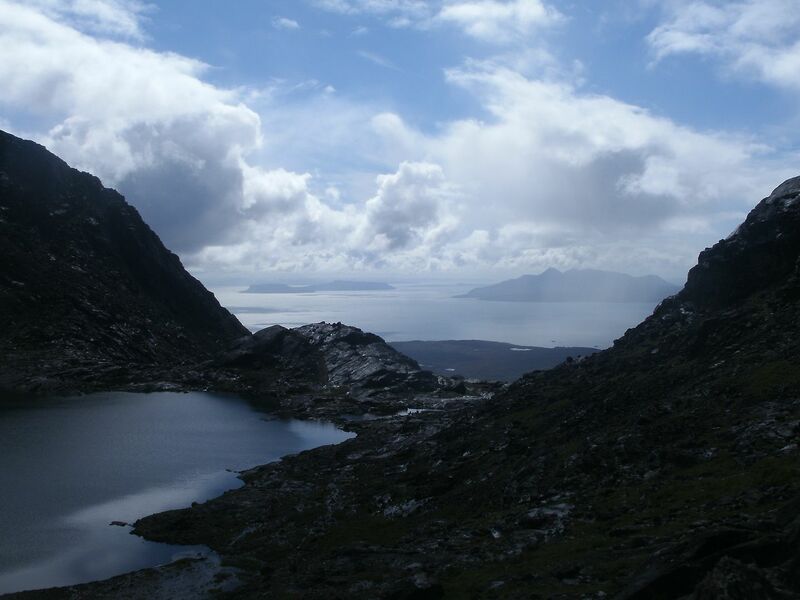 We have the SMC guide 'Scrambling on Skye' which is handy for looking to see if the way ahead is feasable or not, but generally the worst bits are well talked about, so in the back of the mind to avoid! 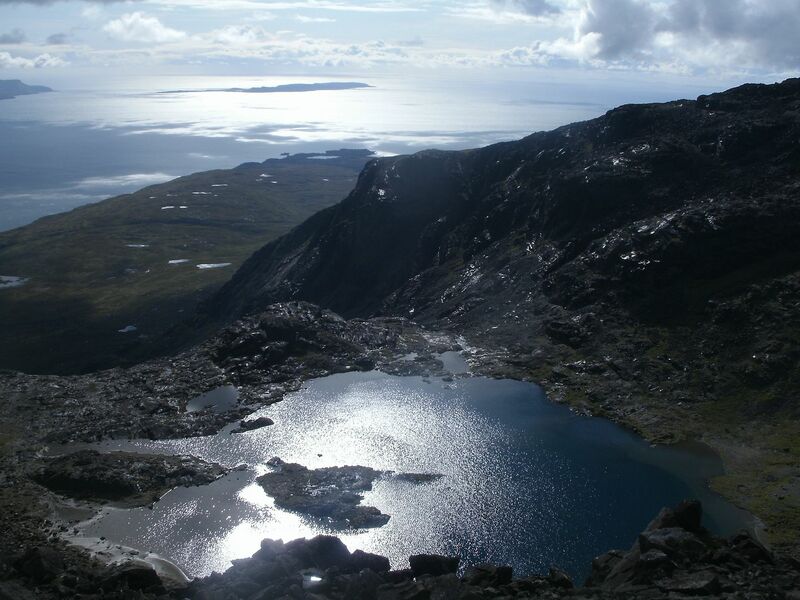 Been from Gars Bheinn to Bannachdich as a continuous walk once but sticking like glue to a guidebook description. 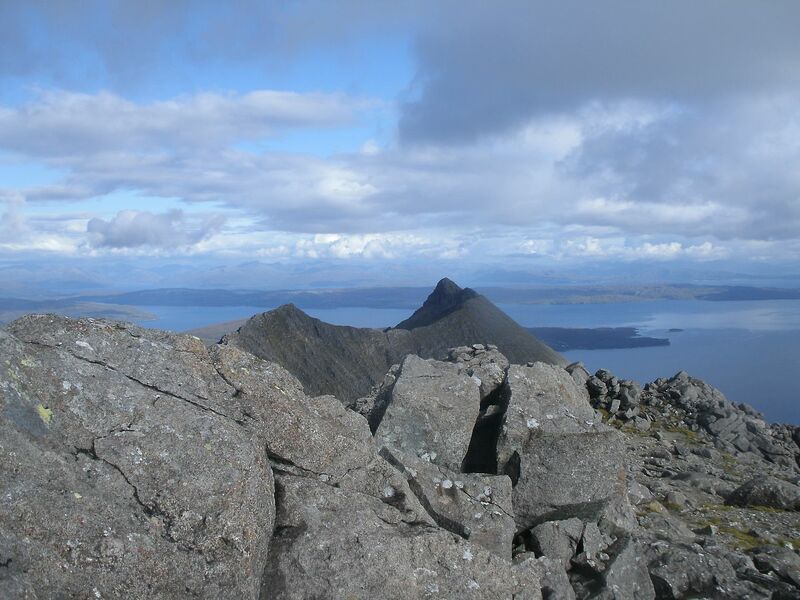 First time I was there though I went from Gars Bheinn to Alasdair and got stuck by going north instead of south on the scramble to the summit but descended ok via a scree run west of great stone shoot. 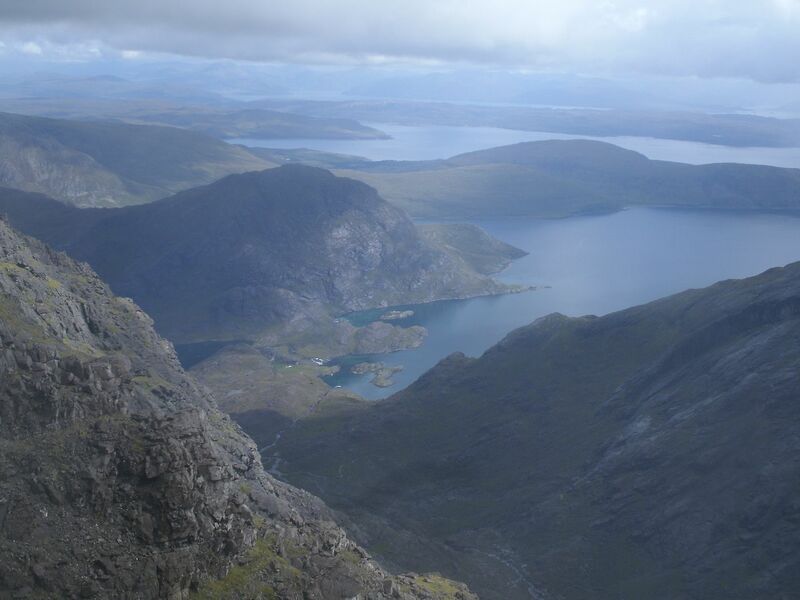 That was followed next day by a route from Sgurr Dearg to the great stone shoot. Wouldn't fancy any of that in the wet though.